If there’s never a Boris Bike free when you want one..
AS everyone drools on about what a fantastic achievement Boris Johnson’s Boris Bike bike hire scheme has been, there’s more than a couple of would-be users who are a bit miffed as to why there are no racks in busy places like Camden Town and beyond. Unless you live in the south of the borough, chances are you are out of the catchment area on this one. 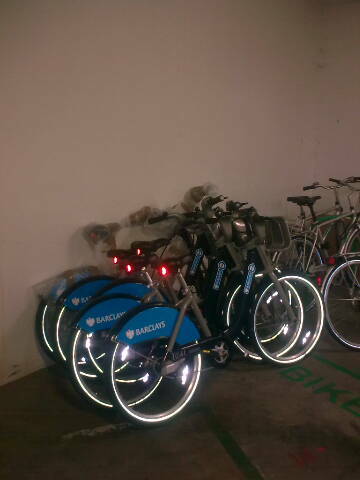 If only those potential cyclists had the keys to the ‘bike cage’ in the basement of Camden Town Hall in King’s Cross. This picture which screeched into my inbox this afternoon appears to show four of those elusive BBs stacked up down there. Gathering dust, my mole reckons, a wasted resource which could be out on the streets in constant use. So what are they doing there? Has Camden Council helped itself to exclusive use of some of the bikes? Or does it have some rich and carefee employees who can afford to keep the meter running at all hours? 2 Comments on If there’s never a Boris Bike free when you want one.. These could be some of the bikes that were given to councils before the scheme started as some sort of teaser and to allow them to provide some training to members of the public. In any case, this is only the tip of the iceberg. Because TfL has not been able to install all the 400 docking stations it had planned (thanks mostly to Westminster Council, it seems), there are apparently 1000 bikes waiting in a warehouse in Islington. used.